Our entertainment center counts with 26 projectors PT-D5600, PT-D3500, and PT-AX100 models. These projectors are distributed as follows: 5 in the bowling area, making a diagonal screen size of 270 inches, other 5 in the videogames area, projecting a diagonal screen size of 140 inches, 8 more in the tavern area, showing a diagonal screen size of 210 inches and for last but not least 8 in the movie theater entrance with a diagonal screen size of 460 inches. We chose these Panasonic projector models because of their excellent resolution and sharpness, after making a comparison of quality, price and especially technical support, we decided for Panasonic projectors. In Panama there is always an excuse to have a good party! Either right after office hours, watching your favorite sport game or having fun with your children, your attention is always caught by the vivid color and bright images. "Extreme Planet" incorporates the superb attractions for children, youth and adults, including a well known Irish American grill & tavern place, a kid’s zone for parties and games, a game arcade, a movie theater, a lunch bar and a bowling alley. DLP™ and home theater projectors are used all over the place for previews and advertisement in the theaters and for video projections at the tavern and bowling place. 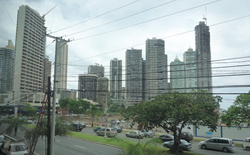 Extreme Planet is located in a highly prestigious area of Panama City, overlooking the beach and surrounded by skyscrapers, busy streets, and popular shopping malls. The challenge was to combine several environments for the entire family, incorporating the latest video and sound technologies. 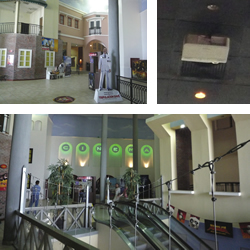 The result was movie theaters with an awesome advertising projections, astonishingly vivid sport games at the grill & tavern, and eye catching large screen videos for all guests, who come to spend precious time with the whole family. The lens shift feature along with the widescreen (16:9) panel in the PT-AX100 were the key factors in replacing another brand of projectors in the movie theater with our Panasonic models. They had been using different brands in each area before we approached them, and each one was adapted for the desired projection distance. We replaced them with PT-AX100 projectors, and used their special features to fill the big screens with 16:9 high-quality images. As a result, Panasonic is now the only brand in the entire movie theater. 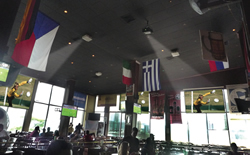 These DLP™ projectors allow the grill & tavern to offer to the customers the best, biggest and brightest color images. In addition, five PT-AX100 models pull viewers right into sports games and concerts with their superb image quality. There is no better time to go out with friends than right after office hours. This is a great time to enjoy a nice atmosphere with remarkable music concerts or sports games. The PT-AX100 provides bright, vivid colors with low maintenance costs and high reliability. This configuration lets parents take their kids bowling without having to miss the best parts of their favorite sports game or event. Five powerful screens make the installation flexible and welcome visitors to the bowling alley while keeping them in touch with the latest news, video clips, and sports games. Bright, colorful, lifelike images were a must here. 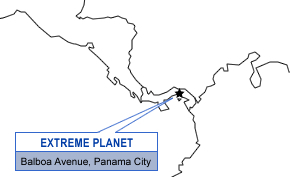 Extreme Planet is a major attraction thanks to this installation, and has made a name for itself in Panama City. Extreme Planet and Panasonic Latin America S.A.